Sydney's Fashion Diary: CLOSED: Chicwish Giveaway! It's been a while since I hosted a giveaway. 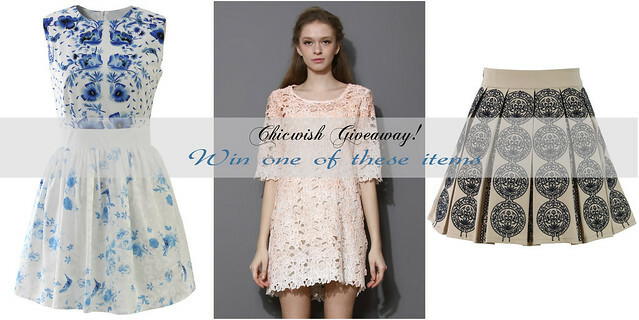 I thought I would start the week off with a fun giveaway c/o one of my favorite stores - Chicwish. For this giveaway, you will get to choose an item of your choice. Please note this shift dress is completely see through. You would have to wear a slip underneath. As for the pleated skirt, the waist = 12" and the length = 15". I will announce the winners next Sunday 05.18 (this giveaway is open to U.S. residents only). Good luck! 1. Follow Chicwish on Facebook. 2. Register an account with Chicwish and leave a comment below to let me know which item you would like to win. I love all of them. So beautiful!! Wow they seem to have great pieces! I love the midi skirt you featured! Wonderful outfits. My favorite is the floral dress. Hi! I'd love to win the midi skirt! I would love to win that beautiful floral dress! I would love to win the floral dress! :) (fb name: R Garcia Mico) Thanks for hosting the giveaway! I'll love to win the floral skater dress with crossing back! I would love to win the blue balloon flower print dress.